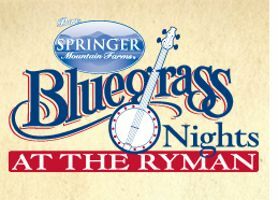 Nashville, TN -- Designated by the State of Tennessee has the Birthplace of Bluegrass, the Ryman keeps the tradition going with the annual Springer Mountain Farms Bluegrass Nights at the Ryman series. This year the series will feature Vince Gill June 23, Del & Dawg (Del McCoury and David Grisman) June 30, Greensky Bluegrass July 7, Rhonda Vincent & The Rage July 14, The SteelDrivers July 21 and Ricky Skaggs & Kentucky Thunder July 28th. Showcasing the very best in Bluegrass, the series runs Thursdays from June 23 to July 28. The 2016 series will kick off June 23 with twenty-time Grammy® award winning singer-songwriter and Country Music Hall of Fame member Vince Gill. On June 30 audiences will experience the pairing of two legends, Del McCoury and David Grisman. McCoury, a Bluegrass Hall of Famer and Grammy® winner , will join forces with acoustic music pioneer and master mandolinist, Grisman (aka Dawg, a nickname given to him by Jerry Garcia), for a very special show celebrating fifty years of friendship and collaboration. Rising from the festival circuit, Greensky Bluegrass became an underground sensation and will bring their energetic, progressive Bluegrass sound to the Ryman July 7. Still fresh off winning the 2015 Grammy for Best Bluegrass Album, The SteelDrivers, will headline the Ryman for the first time on July 21. The July 14 and 28 shows will be announced soon. All shows will begin at 7:30 p.m. Preshow festivities will kick off at 6:00 p.m. with Pickin’ on the Plaza presented by WSM 650 AM. Featuring performances by rising stars of the Bluegrass world, Pickin’ on the Plaza will take place in front of Cafe Lula, the Ryman’s new eatery and bar. Ticket holders are encouraged to come early to enjoy the music along with dinner and a cocktail. Tickets are just $28.50 for each show plus applicable service charges and are available via Ryman box office, www.ryman.com, or by calling 615-458-BLUE. $150 season passes for all six shows are also available.